Trinity College Associate Professor of History and American Studies Scott Gac was featured in the recent installment of C-SPAN’s “Cities Tour” series that focused on Hartford. 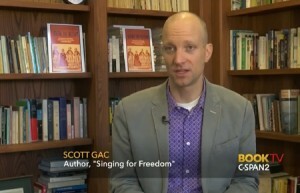 Gac discussed his book, Singing for Freedom: The Hutchinson Family Singers and the Nineteenth Century Culture of Antebellum Reform (Yale University, 2007), about one of the most famous American family singing groups of the 1840s and its impact on the abolitionist movement. Click here to watch the 16-minute video, which includes art, photographs, and music from the era. 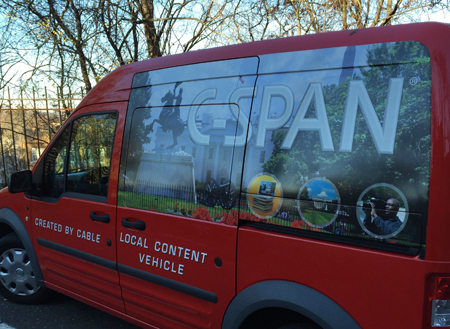 According to C-SPAN, “the ‘Cities Tour’ brings C SPAN programming to your community, interviewing local figures and visiting area sites using specially outfitted Local Content Vehicles (LCVs).” Gac was interviewed on campus in Seabury Hall’s History Library when one of C-SPAN’s LCVs came to Hartford last fall. Each installment of the series features the history and literary life of a different community. The history segments air on American History TV (AHTV) on C-SPAN3 and the literary events/non-fiction author segments air on Book TV on C-SPAN2. The Hartford segments were broadcast on January 16 and 17, and are now available online.